Final cleaning charges as quoted. Bed linen and towels by local arrangement as quoted and local Swiss Tourist Tax payable on the spot. This very spacious luxury chalet (193 m²) boasts a stunning location with magnificent, panoramic views from its wide wrap-round sun terrace. Recently built to a very high standard, it is arranged over 3 floors. There is a lower ground floor with a double bedroom and a twin bedroom, a bathroom and a laundry room. The ground floor has a bathroom, another bedroom, a sauna and a bath and shower, ski boot storage room, well-equipped kitchen with breakfast bar and a lofty, open-plan living room with dining area (table and sufficient seating for up to 12), leather settees and a cosy, open fireplace. Wide-screen HD TV available(+ TV in master bedroom) including Sky plus English and other language channels; DVD/Blueray player, CD/Ipod player, radio. Free High speed WIFI Internet. On the first floor there is a double bedroom with wide balcony off, a further twin bedroom, a twin room with full-size bunk beds and a bathroom. Kitchen equipment, crockery and glasses are plentiful and fixtures and fittings all modern and comfortable. Bedrooms all have wardrobes/storage space. Stair gates, 2 cots and 2 high chairs can be provided for young families. There is free indoor garage space available for 2 cars opposite. With access to Verbier and all the 4 Valley skiing in winter and, in summer, plenty of wonderful mountain activities to be enjoyed, it's perfect for families or groups of friends travelling together. Transport: By air - Multiple daily flights operate into Geneva (Cointrin) from most of the major UK and European airports. UK carriers include British Airways, Swiss Air and Air France and budget airlines such as Easyjet, Jet2, and Flybe. Other European connections include Zurich, Berne, Basle-Mulhouse, also Chambery (France) and Milan (Italy). By train - There are regular train services (2/3 per hour) from Geneva Airport to Sion with onward travel from the rail station via the by the local Post bus or by taxi. By car - Car hire is available from Geneva Airport with rentals through any of the main car hire companies.Taxis all the the way from Geneva Airport can be pre-booked or there are new shuttle bus services operating from both Sion and Geneva Airports. If you prefer to take your own car, the drive from Calais to Sion will take approximately 9/10 hours followed by a straightforward drive via a wide mountain road to Les Collons. Snow chains are required by law in winter. Unique selling points of the property: Chalets are usually built on the outskirts of mountain villages and can be tricky to access, especially in winter. Often it means getting into a car every time you want to go anywhere. Not so Chalet Etoile Polaire, which we think has the perfect situation in the middle of a village which is part of Switzerland's famous Four Valleys ski circuit. It does not suffer from the over-crowded pistes or the lengthy lift queues which can affect its more famous neighbour Verbier. Thus, a central location coupled with first-class skiing without the hefty price tag, makes Les Collons a relatively undiscovered little gem! In summer, the unspoilt beauty and Swiss alpine charm of the region is captivating. Crystal-clear mountain air with long hours of warm sunshine - this area enjoys a micro climate boasting the same hours of sunshine as the South of France! There are a myriad activities on offer such as walking and hiking, mountain biking, golfing, wine tasting, chilling out in thermal springs, discovering small, chocolate-box villages or exploring historic towns - altogether it makes a great base for a family holiday. What better way to relax and revitalise but when you want more, there are plenty of activities on offer Mountain walking (300 km marked trails) including gentle walks along the 'bisses' (ancient water irrigation channels) or more strenuous hikes at altitude. Mountain biking (250 km trails, including the amazing 44km trail at Mont Fort - local bike hire). Tennis - 2 courts close by. Wine tasting tours in local vineyards. Guided local nature walks. Mini golf and Swimming pool at Thyon. Paragliding school at Evolene. Horse riding and trekking. River rafting on the Rhone. Beach and water sports at Lake Geneva. And for children, a local playground, Happy land, the Adventure Forest at Vercorin and water park at Aigle. As soon as we stepped onto the chalet balcony, we were blown away by the view, a breathtaking panorama on 3 sides, spanning the length of the beautiful Herens Valley with a backdrop of mountain peaks including the mighty Matterhorn. We were instantly smitten! The small village of Les Collons has proved a perfect spot for us - it's a cosmopolitan mix of local folk and second home owners with an easy, relaxed atmosphere. The region as a whole benefits from an amazing microclimate with long, sunny days and clear, starlit nights. At 1800 metres altitude, snow cover in winter is never a problem, but neither is access as the chalet is quietly situated just off the main village street. Inside, it offers all creature comforts being exceptionally roomy and spacious - cosy and warm in winter and light and airy in summer. It's our idea of heaven,a real home from home! Chalets are usually built on the outskirts of the mountain villages which means they can be tricky to access in winter. Often this means getting into your car everytime you want to go anywhere, including the ski slopes. Not so ours ....which we think has an ideal location right in the middle of a mountain village which is part of the fabulous 4 Valleys, Swizterland's largest linked ski terrain. The fast quad Trabanta charilift is just a couple of minutes' walk down the road and there is a ski bus stop opposite so although not right on the piste, this chalet is as good as. You can always ski back down to the villages at the end of the day and when snow is good virtually right back to the chalet itself. What's more, Les Collons does not suffer from the over-crowded slopes or lengthy lift queues which can affect its neighbour Verbier. Thus you have a central village location coupled with all the first-class skiing of an extensive ski circuit right on your doorstep.... without the hefty price tag! An added bonus, it's a great place in the summer-time - for outdoor pursuits like walking and mountain biking but also for generally chilling out and breathing in the pure mountain air! toilet, shower, Double wash basin. Sauna 2 hair driers are provided. Glass covered fire place with stone surround. Package with television offering high speed broadband. Bookcase with selection of books, , maps and tourist literature. Ski maps, bus timetable etc. 1st floor balcony off master bedroom Lower ground floor terrace off 2 twin bedrooms Wide,sunny terrace off main sitting room. 2 tennis courts 5 minutes walk.. Raquests and balls can be hired from the Tourist Office. Sion 18 holes Golf Course 20 minutes drive. Also courses at nearby Crans-sur-Sierre, Leukerbad and Villlars. Not suitable for the elderly or infirm. Traditional sauna with electric hot coals, thermometer and timer. Private garage parking (across road) for 2 vehicles. Underfloor heating throughout the ground floor. Sun loungers provided on the sun terrace with 2 large dining tables and chairs for outdoor eating in summer. Ample extra storage in a second entrance hall and ski/ boot room. A short flight of steps down to the front door make the chalet unsuitable for the elderly or disabled No smoking policy. No pets. No stag or hen parties. Great Chalet, great view and great facilities. The Chalet was clean at our arrival, the informations given by the owner were clear. The view you had in the chalet was amazing. The Chalet own everything needed for great ski holiday. The only drawback was the access from the chalet to the ski slopes (15min by walk with the skis) but there is a bus stop near the chalet so you can avoid walking in the morning. As you say the main chairlift is just down the road and if you don't fancy the walk the ski bus will take you there! Hope to welcome you again sometime. The fact that this was our third visit to the Etoile Polaire speaks for itself. This spacious, well appointed chalet in the middle of Thyon Les Collons is perfect for a large group. Not only is it clean and functional for up to 12 people , the chalet also breathes an ambiance of well being inside and to the outside, it has breathtaking views down the valleys of Herens and the Rhone and up on the impressive heights of the snow covered Alps. The nearest ski lift which connects to the massive ski system of the Quatre Valées reaching up to Mont Fort above Verbier at 3328 mts is within walking distance or there is a regular shuttle service. For those who would not like to go to such lengths or heights as Mon Fort, there is plenty of skiing and courses at all levels on the Thyon and Veysonnaz pistes. For non-skiers there are several walking trails which are not too testing and offer superb views, a small skating rink and dog sleigh rides. The village of Les Collons is a quiet, family resort. There are no discos or nightclubs but there are several shops, bars and restaurants and a well supplied but small supermarket. After our third year's stay in the Chalet Etoile Polaire and 6 visits to Thyon, we highly recommend both the chalet and the resort. Wow! And thank you hugely for your review. That is high praise indeed plus an informed view since you know the chalet and the area so well now. ! I am delighted that you all enjoyed yourselves for this your third stay. Of course we love Chalet Etoile Polaire too - a cosy "home from home" in the amazing Swiss Alps. We welcome you all again any time. We were a family of 6 adults and 4 children staying for the annual family ski week. The chalet was very comfortable and spacious with 6 bedrooms and 4 bathrooms and plenty of storage area for boots and skis overnight, excellently equipped and its location was perfect for access to the ski lifts. It is a 5 minutes walk to the chair lift or 1 minute to the ski bus stop which was very convenient for young children being taken up to Thyon for the ski school each morning. The chalet is therefore perfect for families seeking a ski week holiday - the ski runs are excellent with a vast network stretching to Verbier. We made use of the 2 parking spaces and had a third space reserved especially for us which was an added benefit. The chalet has great views of the Swiss Alps with the Matterhorn in view on clear days. We have stayed in the chalet for 2 years and are reserving for a third year in 2018. I was very pleased to welcome you all back - and to know that you all enjoyed yourselves so much again. High season and school holiday weeks are always a busy time but the slopes around Les Collons are never over-crowded, making it an excellent base for family groups such as yours who wish to explore Switzerland's fabulous Four Valleys. Your review is much appreciated - a perfect recommendation. We have just returned from a wonderful stay at Chalet Etoile Polaire. The photos don't do the chalet justice, it has a warm and cosy feel but is spacious all at the same time! We were four couples and two children and the chalet was easily large enough for us all. The kitchen was equipped with everything you could need and more, we cooked every night in the chalet and there was everything you could possibly want to enable you to do this. If you are arriving via car I would recommend stocking up with supplies at a supermarket in Sion before travelling up the mountain, as although there is a supermarket in Les Collons it is not huge. The chalet was spotless and very well maintained in an ideal position in Les Collons with easy access to all facilities available. Tina was excellent to deal with, responding very quickly to all queries and was very informative about the local area. The skiing was excellent and the scenery was absolutely stunning, the views from the chalet balcony were amazing. 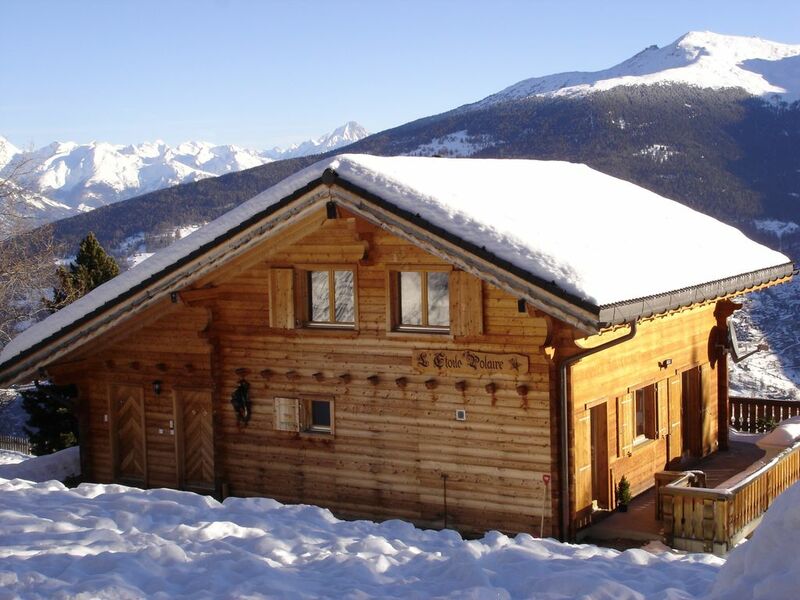 I would not hesitate to recommend this chalet as it was truly perfect. Thank you so much for your lovely words...and so pleased you all had a great holiday. Come back anytime - I always remind my chalet guests how wonderful the mountains are in summer...walking and trekking, mountain bike trails, relaxing in thermal hot springs, golf, tennis etc. etc. - it makes a nice alternative to the traditional beach holiday. We stayed for 8 nights as a party of 11. Les Collons was ideally situated for the Thyon Dixence and Sierre Zinal mountain races that we had come to do. There are lots of walking, road biking, mountain biking and trail running possibilities in the immediate area. The chalet is very well equipped, spacious and comfortable. The views from the chalet, particularly of the Dent Blanche, are stunning. We had a week of great weather. Very hot during the day down in the valley but perfect at 1800m. Thank you for your review and I am delighted that you all enjoyed your holiday at the chalet so much. We are a family of 6 adults and 4 children (ages 5 -14). We found the facilities at the chalet excellent and very well equipped. The bedroom accommodation very conveniently matched our requirements. The chalet's location in the village of Les Collons is very convenient for accessing the Trabanta chairlift or the free ski bus up to Thyon 2000 which picked up at the Office de Tourisme approx. 50 mts walk away. The car parking spaces in the garages opposite were a great advantage. We found the chalet extremely comfortable. We are familiar with Les Collons and believe that Chalet Etiole was an excellent find. Thank you for a nice review. I am really pleased to know that you all enjoyed yourselves. The chalet location is very convenient for all the village facilities and of course for the ski slopes themselves. It makes it all the easier for parents with children to relax in the knowledge that everything is to hand. Needless to say I would be delighted to welcome you all again and half term school holiday dates are still available for next year too. One of the best centrally situated chalets in the mountain village of Les Collons, Chalet Etoile Polaire (it means 'North Star') stands at a snow-sure altitude of 1800 m. Les Collons is on the eastern fringe of the fabulous Four Valleys which includes world-famous Verbier and it offers a ski circuit of over 400 km with 99 lifts up to an altitude of 3300 m. This is Switzerland's highest and most extensive linked ski domain and here you'll find a superb mix of skiing and snow boarding for all abilities. The chalet enjoys a quiet, central location, set back from the main street, just a 2/3 minute walk from the main Trabanta hi-speed chairlift and it's virtually opposite a ski bus stop. Access is never a problem (as with so many other chalets located up steep, winding roads) and all the village amenities, including sports/ski hire, supermarket, bank ATM, shops, bars, cafes and restaurants are right on your doorstep. The uninterrupted, panoramic views from the chalet balcony are spectacular extending along the length of scenic Herens valley to the mighty Matterhorn and beyond and in the other direction over the Rhone Alps. Golf: There is an excellent 18 hole golf course at Sion (20 minute drive) and another 6 world class courses within an hour's drive including the renowned Championship course at Crans Montana and those at Villars, Loeche and Verbier. Ski/snow boarding : The small village of Les Collons is situated at the eastern edge of the 4 Valleys, Switzerland's highest linked ski domain. It's a skiers' paradise with access to over 400 km of pistes and 99 lifts interconnecting in an extensive ski area around Verbier, the latter which can easily be skied in a day. With opportunities for skiers and snow boarders of all levels, the more advanced will relish the challenges of Etherolla, the limitless off-piste and the mogul fields near the Mont Fort Glacier; intermediates will enjoy the long, cruising runs around the Printze area including the famous World Cup 'Piste de l'Ours' and beginners will gain confidence on the wide, open slopes at Thyon 2000. A snow boarders' freestyle park at Thyon is considered the best in the area and video filming allows you to review your exploits on screen. The local accredited Swiss ski school has an excellent reputation and also has a children's snow kindergarten (over 3.5 years) and a creche for the tinies (18 months - 3 years). There is usually a special programme of children's activities.